Learn more about Mexico and other countries in our daily postcard e-letter. Simply enter your email address below and we'll send you a free special report - Why Millions of Americans Are Moving to Mexico. I’ve lived in Mazatlán, Mexico for the past 10 years, moving here after my kids were grown. 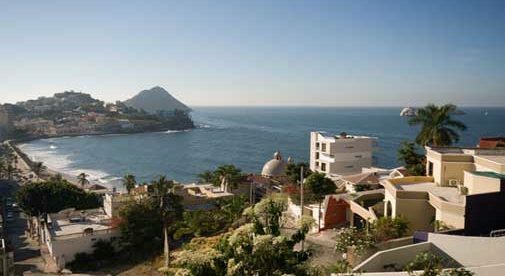 Mazatlán is a mid-sized resort city on Mexico’s Pacific coast, with beaches that attract tourists and surfers, and easy access by ferry to La Paz, across the Gulf of California. I wasn’t yet retired when I moved here from Northern California, and still had to work, but I’ve been able to start my own business: an English-language magazine for the expat community. It’s not only successful but fun to do, and helped me learn about my new community. A typical day for me starts out early. I get up with the birds at 6 a.m. and then usually I do some kind of exercise. Maybe I’ll ride my bike along the beautiful beachfront esplanade, called the malecon, that stretches from Mazatlán’s Centro Historico to the hotel zone. Or I might walk along the beach itself, with the water lapping at my feet, for a change of pace and more tranquil scenery. A few years ago, I took up surfing, and it has become one of my favorite things to do. I was 56 when I started, taking lessons from a local surf school, and have since bought my own board and learned enough that I can go out on my own. It’s something I’d wanted to do my whole life, and finally I’m able to. Most of the other surfers are young enough to be my grandchildren, and I know they get a kick out of seeing me in the line-up, waiting for a wave. I’m not very good, but I always have a great time and love being in the ocean. Next, it’s time for coffee (iced of course) and breakfast, either at home or at one of several espresso shops nearby. If I’m in the mood, there are also taco stands open only for breakfast, where for under a dollar, I can enjoy a savory chicken, beef, or smoked marlin taco, deliciously complete with handmade corn tortillas, an array of fresh salsas, and the conviviality of my Mazatlecan neighbors. At first, I struggled to learn to relax and not worry so much or work so hard. That might be one of the hardest things to do—and the biggest benefit to living in Mexico. You read about “leaving it all behind,” and I can tell you from firsthand experience that’s a challenging mindset to adopt. But once you do—and I guarantee if you move to Mexico, you will—you won’t regret it a bit. If ever I forget how wonderful my life is in Mexico, all I have to do is talk to friends that are still living in the U.S. Then I see just how much I’ve actually forgotten: What it’s like to have a stressful life. A tight schedule. Not enough money to do the things I want. Having to live in cold, dreary weather for months on end. There’s always a point in the conversation where I have what I’ve come to call a “reality check.” They’ll be on their morning commute to work, already tired and unhappy, and I look outside my window at my view of the sparkling Pacific and remember: This is my life. I did it; I made this happen. Learn more about Mexico and other countries in our daily postcard e-letter. Simply enter your email address below and we’ll send you a free special report – Why Millions of Americans Are Moving to Mexico. This special guide covers real estate, retirement and more in Mexico and is yours free when you sign up for our postcards below.